Being based in Nottingham I have had the opportunity to perform at nearly all wedding venues, hotels, stately homes etc etc. Fortunately due to the years (over 10 years) performing I have been invited time and time again to wow guests at wedding all over Nottingham. I am also regarded as one of the top magicians in Nottingham having won multiple awards for my magic and at nearly every wedding I perform at, I get an email saying how I exceeded expectations and I usually get more and more enquiries. There are various options to have me performing at your wedding but what make me unique is that I offer ‘exactly what you require’. I offer close up mix and mingle with your adults guests, I can make balloon models for children, I can perform a separate show for the children. You name it I will try my best to be as flexible as possible to make sure you get the level of service you require for your big day. If you want your guests coming up to you saying how good the magician is BOOK ME. You will not be disappointed. You can view videos of me on my website http://www.alexmagic.co.uk and there is some footage of me performing on Channel 4’s Four weddings on the web somewhere also. I am not only regarded as one of the best magicians in Nottingham but not only that, I always turn up am easy to contact and I make booking me easy peasy! 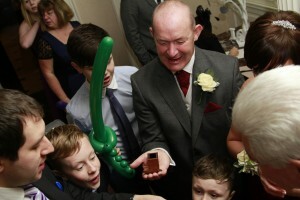 Wedding Entertainment Nottingham – Wedding magician Nottingham – Please have a look at my extensive testimonials.